Kingridge Square, which started as a planned high-rise apartment development, has morphed into Fortress Real Developments Inc.’s first foray into the commercial condominium market. Fortress and Kingridge Developments are partners at the site, located on Speers Road just east of Dorval Drive in Oakville, Ont. The 4.95-acre property includes four buildings at 209, 217, 225 and 235 Speers Road, with unit sizes ranging from approximately 1,000 to 1,600 square feet. That partnership led to the shift in focus. “We weren’t specifically looking to get into the condominium commercial business, but the plan presented by Kingridge Developments made perfect sense for the area,” Ben Myers, Fortress’s senior vice-president of market research and analytics, told RENX. Fortress chief executive officer Jawad Rathore credited Dan Marion at Kingridge with the idea to transform the development. The success of Kingridge Square has led Fortress to create a second commercial condominium site in the Greater Toronto Area, this one in Markham. Construction continues on that project, which is scheduled to open this fall at Woodbine Avenue and Markland Street. In total, there are 64 office condos available at the low-rise Kingridge Square, as well as 306 surface parking spaces. The Oakville condos are almost 90 per cent sold, Myers said. Remaining units range from 1,182 to 1,304 square feet and are priced from $591,000 to $652,000. Sales information is available at www.235speers.com. The firms contracted CBRE to begin selling the units in 2014 and construction began in 2015. The first owners at Kingridge Square took possession in early 2017. The buildings are occupied by a variety of small businesses including accountants, tax advisors, lawyers, engineering firms, insurance agents, investment planners, realtors, construction companies and medical professionals. First Service Residential is managing the site, which has easy access to the QEW highway connecting it to nearby Toronto and Hamilton. It is also immediately adjacent to the burgeoning Kerr Village area, which provides ease of use for the owners, tenants and their customers. 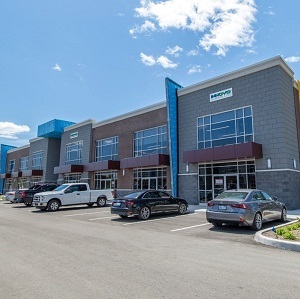 “CBRE did a tremendous job at selling the units, and espousing the virtues of owning an office instead of leasing,” Fortress COO Vince Petrozza said in the release. Fortress is a diversified Canadian real estate development company that seeks out and analyzes opportunities in major Canadian markets. It has been involved in more than 70 projects including rental apartments, high-rise condominiums, hotels, office space, big box retail, residential conversions, ground-floor retail and more. Its portfolio includes more than 10,000 units, an estimated land value of more than $1 billion and estimated build-out value exceeding $6 billion. Kingridge Developments is a fully integrated development company headquartered in Oakville. For more than a decade, Kingridge has acquired and developed single and multi-unit residential and commercial projects throughout southern Ontario.